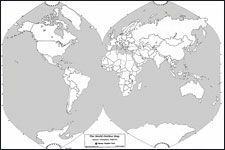 Geography Matters World Outline Map is a great learning tool because it has no country names pre-printed on the map - a blank world map. The current political boundaries are drawn, but nothing else. As a bonus, a U.S. blank outline map showing only state boundaries is on the reverse side . Size is 34" x 23". Item Number Size / Folded / Flat / Paper / Laminated Price Qty.